Twelve Days In May: Freedom Ride 1961 by Larry Dane Brimner, chronicles the journey of 13 black and white Civil Rights Activists from Washington D.C. to New Orleans. The riders planned a protest of the southern states ignoring two Supreme Court rulings that segregation on buses crossing state lines was unconstitutional. The protest was meant to be peaceful and shine a light on the nonobservance of the rulings in the south. What met them on their journey was violence and hate. The author sent me a hard copy of this book in exchange for my review. Under normal circumstances when authors send me books for review, they send e-copies. It becomes apparent upon opening the envelope why this author’s support staff wanted to send a hard copy. The paper book is stunning. The 112-page hardcover edition is beautifully laid out and makes for an easy but information-packed read. The size is that of a smaller coffee table book and the illustrative pictures serve as a poignant focal point, the descriptive font is large and easy to read. Laid out chronologically, Brimner starts with “Landmark Events Before the Freedom Right” so as to set the reader within its historical context. Brimner itemizes each rider giving readers context on the brave folks who ventured into the unknown to stand up for what they believed. It’s easy to stay at home and read the book thinking of how frightening the journey must have been, but it’s another thing to see the picture of the little Klansmen and know the ingrained hate and anger they met. As mentioned with the child Klansmen, some of the pictures are shocking to a reader of today. Welcoming visitors to the State of Alabama was a sign announcing the presence of the Klan and after experiencing violence in Rock Hill, South Carolina, John Lewis with the crown of his head bandaged sits of the floor planning the journey further into the belly of the southern beast. Closing the book is a picture of a firefighter searching the burned out shell of the bus. When the riders arrived in Alabama, two undercover highway patrol officers boarded the bus in an attempt to keep the activists safe and, to their credit, did what they could. Brimner is an observer of the events via primary source and relates them faithfully, the good and the bad. Twelve Days In May: Freedom Ride 1961 is a faultless accounting of an important event in history. The layout of the book makes it appropriate and easily accessible for all ages to delve into the heroes who rose above the inhumanity of history. Given recent events, it’s hard not to draw parallels in this beautifully formatted work of nonfiction. While the events of the Freedom Ride should be required reading, I think people often like to boil the Civil Rights movement down to a limited series of events. The brave actions of these thirteen very diverse people started a series of rides and inspired future peaceful protests. In January 2017, President Obama established a Freedom Ride Monument in Anniston, Alabama. 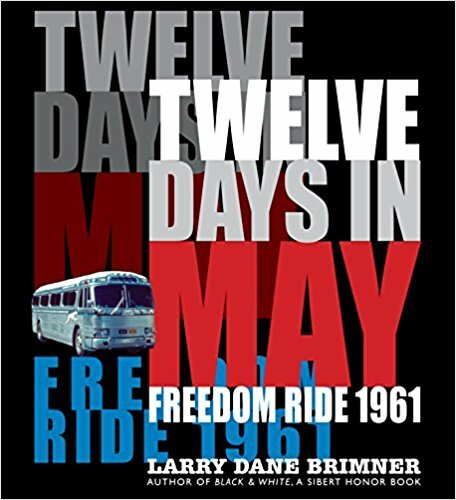 Brimner’s Twelve Days In May: Freedom Ride 1961 is a must read for all Americans. If you have someone who is interested in Civil Rights on your holiday gift list, be sure to pick up this beautifully formatted book for them or, perhaps, treat yourself. For more information about Larry Dane Brimner visit his website. You can connect with him on Goodreads, Facebook and Twitter @kubric1.